Will they adequately screen tenants? Will they take care of my property? Or, will they saddle me with needless repairs and excessive fees? Can I trust them with my money? Do they place rents and security deposits in a trust account? Do they provide timely and easy to understand month statements? Will I get a yearend statement to help with completing my Schedule E? Are they a properly licensed real estate professional? Some states require that property managers be brokers while others only require a sales person license. Are they a member of any nationally or locally recognized professional organizations, such as the National Association of Residential Property Managers (NARPM)? Referrals are great. You may be surprised how people own a rental property or two if you start asking around. Ask your friends and co-workers if they know any reputable property managers. Also, the real estate agent that sold you the property probably knows a property manager or two. 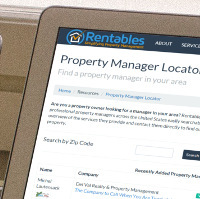 Short of a personal referral, you can use services such as Rentables Property Manager Locator to find potential managers in your area. You should get the basic services provided and fees from every property manager you screen. When the time comes to sign a contract make sure it’s consistent with what the property manager originally told you. Management Fee: Percent of rent or fixed fee? Percentage based fees are nice since the PM only gets a raise when you do. Do they change a PM fee when the property is vacant? Tenant Fees: Late fees, notice fees, etc. Who gets them? You or the property manager? Often time property managers with lower management fees don't pass on late fees, and other fees they collect from the tenant, to the property owner. There not necessarily anything wrong with this, but it's good to understand this ahead of time. Tenant placement fees: What does the property management company charge for tenant placement? Do they keep first month’s rent, charge a flat fee such as $500 or, is tenant placement included with their normal management fee? Evictions: Do they handle evictions, including going to court if necessary? What is Typical cost? How long does it typically take? Do they change anything beyond the court or attorney fees? Collect rent: When is rent due? Is there a grace period? Proceeds deposit: Do they offer direct deposit of your proceeds? When will the funds typically be deposited? Or, do they mail you a check? Monthly statements: Are they emailed? Ask for a sample. Are they sent at the same time the deposit is made? Notices: Do they serve tenants with notices such as Three day pay or quit or Notice of entry? Other notices required by your state to keep you out of trouble. Trust account: Are rents and security deposits held in a trust account? Security deposits are consider “Trust Funds” meaning they belong to someone else and are being held in trust. Most states require that they be held is a specially designated account and that the property manager maintain rigorous accounting of those funds. Home Owner Association: Does the property manager handle communications with the Home Owner Association? If the tenant is fined by the HOA, does the manager collect the fee from the tenant and pay the HOA? Inspections: Do they perform and document Move-in / Move-out inspections? Periodic inspections are also nice to help insure the tenant is not damaging your investment property. Repairs and Maintenance: Do they arrange for and meet the handyman? Do they provide before and after pictures? Is there an additional fee for this? Are the invoices included with your monthly and yearend statements? Are they expenses property categorized according to Schedule E to make preparing your tax return easier? Vacancies: Where does the property manager list vacancies? Does someone from their office meet perspective tenants and show the property? What kind of tenant screening do they do? Credit report? Eviction history? Criminal records check? Finding a qualified property manager is not always easy. Compare the services and fees each provide and how those stack up against what's important to you. Are low monthly fees important or are you willing to pay a premium for a more comprehensive set of services. Follow you gut if there is no clear choice after evaluating each candidate. Hiring a property manager is a partnership and it's important that you share similar views on how the property should be managed. Ask for referrals and talk to some of their existing clients. This can be good reassurance that you're making the right choice.